On several occasions, Kucinich referenced RAW STORY and its noted investigative news chief, Larisa Alexandrovna, as source material for the articles. Two of the RAW STORY pieces Kucinich mentioned are viewable here and here. 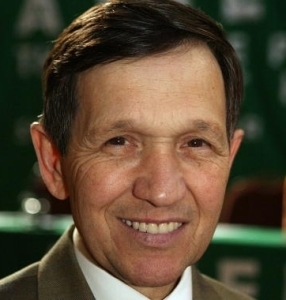 Kucinich, a 2004 and 2008 Democratic candidate for the White House, abandoned a prior attempt to begin impeachment proceedings against Bush in January of this year. Before leaving office in January 2007, then-Democratic Rep. Cynthia McKinney–currently a Green Party presidential candidate–introduced articles of impeachment against President Bush as her last act in Congress, but that effort also was fruitless. Tuesday’s follow-up story at this link: Mainstream media yawns as Kucinich offers impeachment. Plus Impeachment resolution gains co-sponsor. This video is from C-SPAN, broadcast June 9, 2008.
the rules are suspended, the resolution is agreed to. and without objection, the motion to reconsider is laid on the table. the speaker pro tempore: will the house come to order. for what purpose does the gentleman from ohio rise? pro tempore: will the house come to order. please take your conversations off the floor. the speaker pro tempore: will the house come to order. the gentleman from ohio. mr. kucinich: madam speaker, pursuant to clause 2 of rule 9, i rise to give notice of my intent to raise a question of the privileges of the house. the form of the resolution is as follows. the house is not in order.